In the recently organized AWS Summit in New York, a new extension service to CloudWatch called CloudWatch Logs has been added to the AWS services catalog. Earlierly CloudWatch was only monitoring resource utilization so to monitor application level logs we have to opt for third party tools. With CloudWatch Log service, one can upload and monitor various kinds of log files and even filter the logs for particular pattern which could help resolve various production issues like an invalid user trying to login to your application, a 404 page not found error or a bot attempting a denial-of-service-attack. So now, along with monitoring many other AWS services like EBS, EC2, RDS etc. , CloudWatch can monitor and store application logs, system logs, webserver logs and other custom logs. By setting alarm on these metrics, one can also get notified about app/webserver level issues and can take necessary actions with least delay. There are already some services like Splunk, Loggly and Logstash which monitor the logs and provide custom detailed reports. CloudWatch Logs seems pretty basic at this point but one wouldn’t be surprised if Amazon adds more features soon. What makes CloudWatch Logs more preferable over other third party tools? CloudWatch is the single platform to monitor resource usage and logs. CloudWatch Logs pricing is based on pay as you use model which may turn out to be cheaper than third party tools that work on per node licence model. Here you will be paying for log storage and bandwidth used to upload the files. Ingested Data : The data(log file) being uploaded to CloudWatch. Archived Data : All the data(log events) being uploaded to the CloudWatch is retained. One can specify the duration to retain the data. This data is being archived using gzip level 6 compression and stored. The storage space used for archived data is charged. Log Agent : A Log Agent is a python script, running on an instance, which directs logs to CloudWatch. Log events : A Log Event is an activity reported to the log file by the OS/application, along with a timestamp. Log events support only text format. Other kinds of formats will be reported as error in the agent’s log file (located at /var/logs/awslogs.log). Log Stream : Log stream is a group of log events reported by a single source. Take the example of apache server’s access log file. It contains multiple events from the same source i.e. apache web server. Log Group : Log Group is a group of Log Streams from multiple resource. For example, a WebServerAccessLog which reports Apache access log from three similar instances. 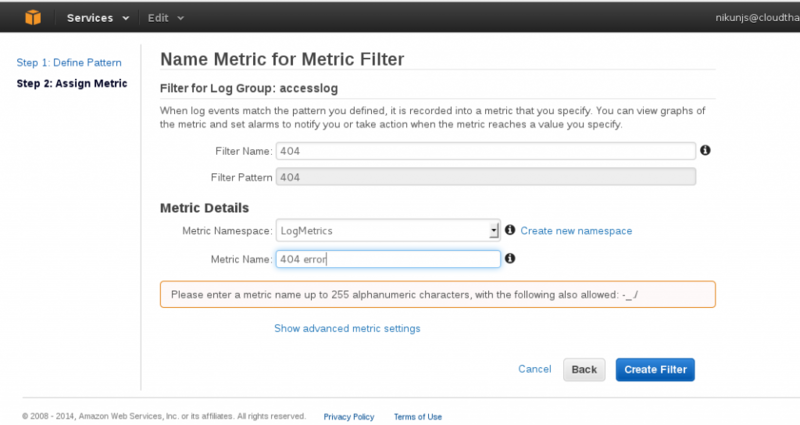 Retention policy and Metric filters are set on Log Group level not on Log Stream level. Metric Filter : The Metric Filters tells CloudWatch how to extract metric observations from ingested Log events and turn them in to CloudWatch metrics. For example we can create a Metric filter called “404_Error” which will filter on log events to find 404 access errors. An alarm can be created to monitor 404 errors on different servers/instances. 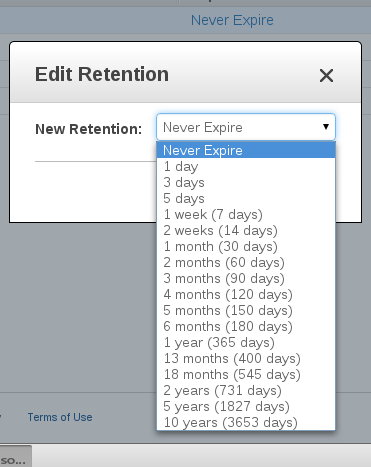 Retention Policy : Retention Policies determine how long events are retained. Policies are assigned to Log Groups and applied to all of the Log Streams in the group. 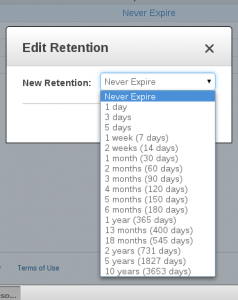 Retention time can be set from 1 day to 10 years or one can also opt for logs to never get expired. Run the following command on the terminal. Attach following policy to IAM user so that Log Agent will be able to take actions on Log service like upload the logs, List the log streams under log group, read the log events etc. Run the following command to configure agent. On the completion of configuration, following details would be listed on the console. Note them down for future reference. 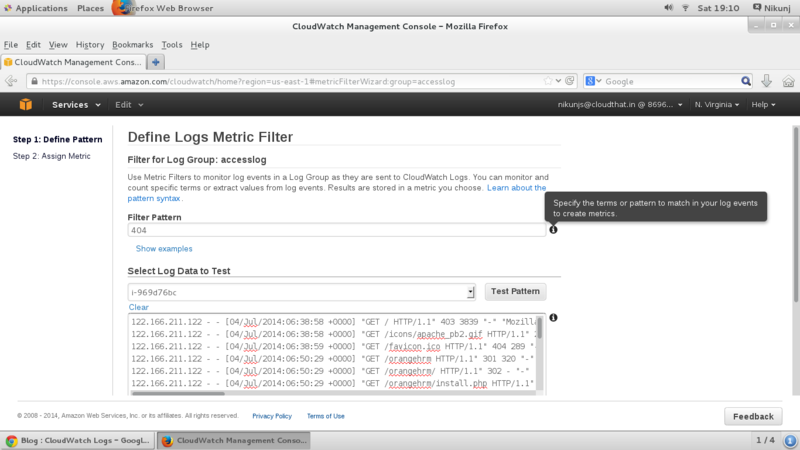 Check the logs in AWS CloudWatch console. Agent would have uploaded the logs to CloudWatch. You can go and check it at the console. Here the log stream is shown for apache access log. By default at every 5 sec a trigger will happen to push the data to CloudWatch. One can configure this duration by changing the conf file of Log Agent. Go to log group and click on Never expire for the log group of your choice. Define pattern to find the error in Log files. Here we are searching for “404” in the apache access log. See the screenshot below. You can test out the pattern to filter and verify the result. Step 2 : Assign Metric to the filter. You can either create a new namespace, select an existing one and give the filter a name. See the screenshot below. Namespaces are container for metrics. 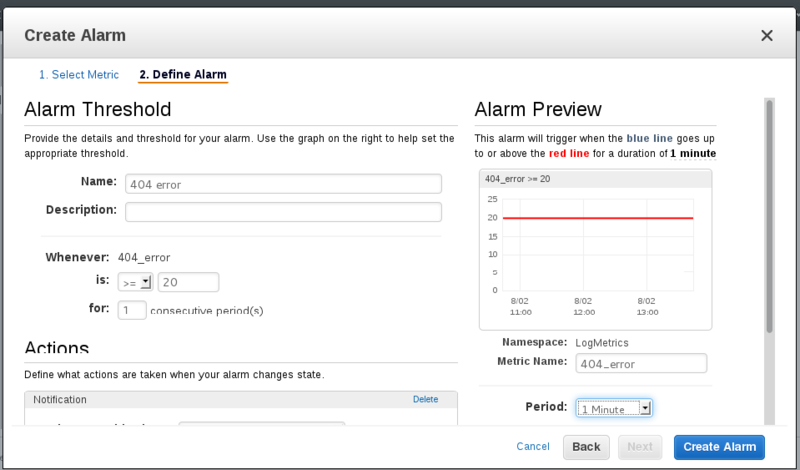 Create alarm for the metric just created. Here we are specifying that if a 404 occurs more than 20 times in a minute, an alarm should trigger as seen in the below screenshot. Regular expression is not supported to set filter pattern. CloudWatch Logs are only available in N.Virginia region. So far we installed and configured the log agent on EC2 instance and uploaded apache access log file to the CloudWatch. Created filter “404” on it and assigned it to CloudWatch metric to monitor. If 404 error occurs more than 20 times in a minute, an alarm will trigger and the notification-mail will be sent to the mailing list. One can configure an alarm to get triggered the event as per requirements and usage. You can configure & install agent and set CloudWatch metrics using CloudWatch API or CloudFormation or with AWS OpsWorks by writing Chef recipes also. If you have any questions, please mention them below and I will try to answer them. Also if you like the article please share it with others. How do I quickly see the lines that matches the filter I have created? How do i push RDS logs to Cloudwatch.